Gan Izzy Ranch Camp is part of the largest and fastest growing network of Jewish Day camps in the world. We are dedicated to giving your child the most incredible and safe summer experience packed with non-stop fun, Jewish pride, exceptional staff, and an unparalleled curriculum. Our sprawling 5.5 acre campus includes a swimming pool, sports field, petting zoo, 4 horses and a pony, a large riding arena, a multi purpose room, shaded gazebos, gardening opportunities and loads more. We offer specialty workshops and electives to give your child the ultimate camp experience! Horse-Back riding, horse grooming and lessons, goat and cow milking, petting zoo maintenance, gardening, wood working, mad science, Kusher culinary and more! 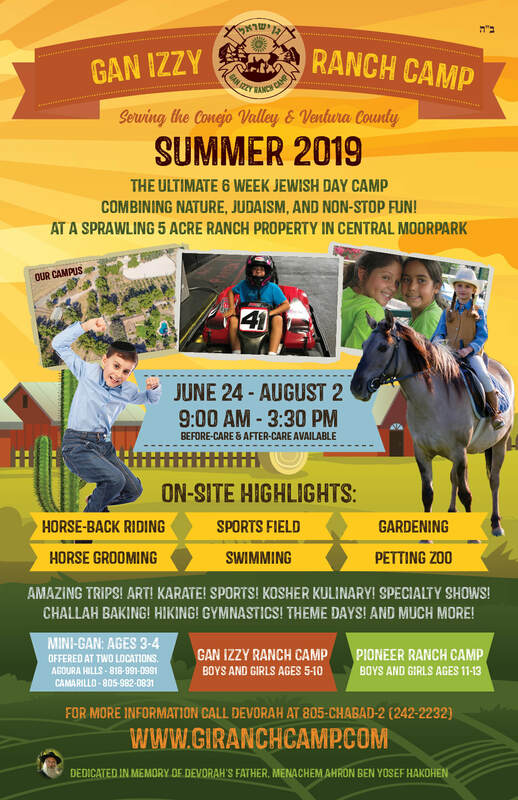 At Gan Izzy Ranch Camp we make Judaism come alive with trips, entertainment, shows, stories, games, prayers, singing, challah baking, Judaica craft-making and MUCH MORE!